GE unveiled Bright StikTM LED, a redesigned, entry point 60-watt replacement LED, accelerating consumers’ transition from CFL to LED lighting—according to GE industry estimates. With an LED 3-pack for under US $10 every day MSRP, Bright Stik is available at www.homedepot.com today and in-store at The Home Depot locations nationwide starting in mid-summer. Industry estimates show that of the U.S.’s 4 billion residential light bulb sockets, less than 10 percent are filled with LED lighting; but by 2020, more than 50 percent will be LED. This year alone, the consumer lighting market is anticipated to more than double with LED while CFL will decrease, and GE is driving further LED adoption with the introduction of Bright Stik. “As we undergo the shift in lighting technology towards LED, we collaborate with vendors to provide our customers with lighting options that save them money and energy. 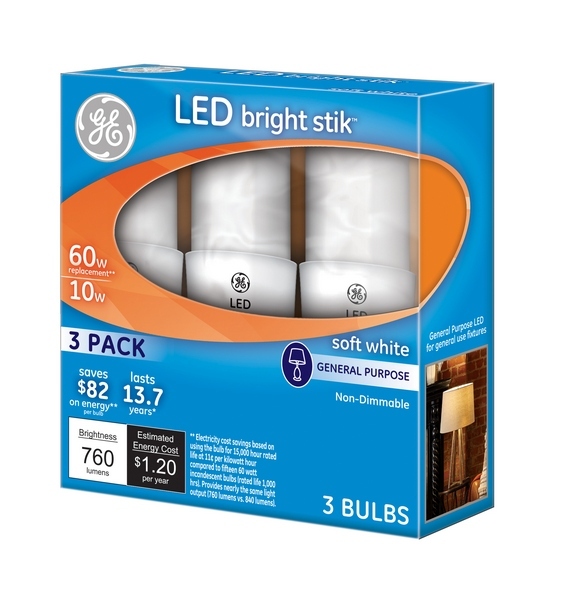 With the GE Bright Stik, we worked closely with GE to develop an affordable LED that offers great quality light and function,” says Joey Corona, Light Bulb Merchant for The Home Depot.